The Achilles heal shared by all smartphones is the limitation to less than a single day of active use. The push for smartphone manufacturers continues to be increase in speed, screen size and clarity, however for the last 4 years we have only seen very modest gains in the time devices last between charges. One of the responses to this lag has been the growth of third party battery packs. Effectively you carry some device that holds charge in a portable fashion and you connect your phone at the appropriate time. My favorite device for this has become Mophie Juice Pack Air. It doubles as both a phone case and a battery pack without *completely* compromising the design, feel or weight of your phone. 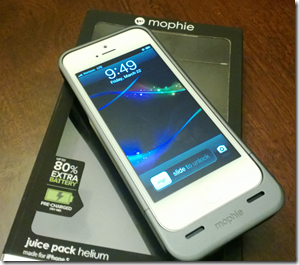 It advertises as providing an extra 80% of charge which gets you fully into day two, you can opt to use the Juice packs full charge first and then switch to your phones battery or vice-versa. It is currently available for iPhone 5 and the Samsung Galaxy SIII. Check it out!